"What if he gets overtired?" "What if his stomach bothers him?" "What if he crashes?" Mitochondrial disease is so unpredictable and never seems to affect two people the same way, so the never-ending questions and worries ran rampant in my head as the first day of Kindergarten approached. I could not stop imagining all the terrible things that could happen to my child due to the stresses a full day of school could bring. Nicholas had been in preschool two days a week for two years prior, but it was a small class, it was not a full day, and he had a day of rest between the days he was there. That put me at ease that he would not overdo it. Full day Kindergarten, on the other hand, just loomed at the end of the summer...big, anxiety-ridden, and unknown. We contacted our school district's special education department in the spring before he was slated to begin school. We thought we would start as early as we could to get everything in order for the upcoming school year. We were going to do everything we could to cover our bases and make sure that we were doing what was needed to prepare the school for him and to prepare him for school. We made an appointment to go in and have him tested for special education, thinking that if he had an IEP, he would be OK. He was tested informally and they declared that he was not a candidate for special education and sent us on our merry way. We were shocked and frustrated, now worrying about the horrors that could befall our child without something in place to hold the school accountable for his health while he was there. In our desperation, we made an appointment to go in and talk to the principal and assistant principal at our home campus about our son's unique medical issues. At this meeting, we laid out everything they would need to consider in regards to his medical care while at school and answered any questions they had for us. Then we went home to wait and see what would happen. We did not have to wait long as it turned out. We received a letter inviting us to an Admission, Review and Dismissal (ARD) placement meeting just two days after our meeting with the school. At this ARD meeting, which is the Texas equivalent of an IEP meeting, we talked about everything from self-help skills to classroom modifications and medical needs. We explained over and over again how tricky this disease is to manage at times, and that a metabolic crisis could come up quickly at any time. He could end up in the hospital because of it if someone was not careful. I saw the puzzled looks on their faces--the look of someone who truly does not understand how a disease like Mito can turn on a dime and wreak havoc with those who are diagnosed with it. Still, we pressed on. When it was over, we felt confident that our child would be well cared for while he was there and the school felt comfortable with the plan for his care. Everyone was happy. The first day of school came and went, with only the excitement of a new chapter of his life starting to mark the occasion. As the days wore on, we saw the signs of wear on our child, but when we brought it up to the school, we were assured that this was completely normal for all children starting Kindergarten and it would improve as he became accustomed to the additional demands that school required of him. He never complained because he loved school so much and he loved getting to run around at recess and play games in PE. About three weeks into the year, everything came crashing down. Nicholas' stomach motility slowed to a crawl and we could no longer get him to eat enough or tolerate tube feeds like he normally could. He complained of stomach pain and had terrible bloating. We resorted to running straight Pedialyte though his tube and watched in disbelief as he was unable to tolerate that either. We called our GI and were told to bring him into the hospital. At the hospital, all food was taken away, his G tube was replaced with a GJ tube and he went home on 24 hour tube feeds once he was able to tolerate enough to keep him hydrated. In the two weeks we were hospitalized, the principal and assistant principal were in regular contact with us to make sure he was OK. I know they were just as shaken and shocked as we were by the entire situation. It was obvious that all the precautions we had put into place had not worked to keep him safe. On the advice of our neurologist, we kept him at home to recover until we could schedule an emergency IEP meeting. We also discussed with our doctor what could have possibly happened that caused him to decline so much in such a short amount of time. Letting Nicholas self-monitor was part of the problem. A five-year-old who wants to keep up with his classmates is not going to listen to his body and stop when he would rather play. He is not going to stop a fun classroom activity to take a drink. He is not going to sit out at PE time when he starts getting tired. We also realized that his body could not handle the long busy day with no breaks for him to rest. We discussed the option of homebound schooling, but decided that Nicholas really needed to try to make this work since he loved school so much. Our doctor wrote a letter to the school outlining the changes that must be made for him to be allowed to go back to school. We came to the IEP meeting armed with that information. We were fortunate that our school was willing to do whatever the doctor wanted. We all found out the hard way that the precautions we thought were enough just weren't. The school got to witness firsthand what happens to someone with Mito when he crashes. I know that is something they are not going to forget anytime soon. Nicholas had a mandatory rest period built into his day and was no longer allowed to participate in PE classes. He now keeps a nap mat in the principal's office where he goes to lay down every day. Some days he sleeps, some days he rests, and other days he reads, but he is still and he gives his body a chance to recoup some from the stresses of the day. He goes to a different special class with another class in his grade level on days when he has PE class. He has an aide who stops by to monitor his water intake and make sure he is taking frequent breaks. He is sent to the nurse any time he complains or looks "off" and I get a call about it. The nurse helps him with anything feeding tube related while he is at school, and she manages all his medical equipment whenever he needs it. The teacher makes sure that he is near her so she can keep an eye on him and that he takes breaks and changes up activities to ensure he is not getting fatigued. The teacher reduces his workload when he gets tired and she gives him the choice to sit in a chair or on the floor at circle time. The principal has kept in contact with his neurologist to make sure there is an open line of communication there, and she gets to ask any questions that will help her to keep him safe while at school. I keep him home on days when he runs a metabolic fever, just to make sure he has adequate rest when his body tells us he needs it. I go on field trips with him to make sure he does not overheat or overdo it. We all work together to make sure that he stays as healthy as possible. 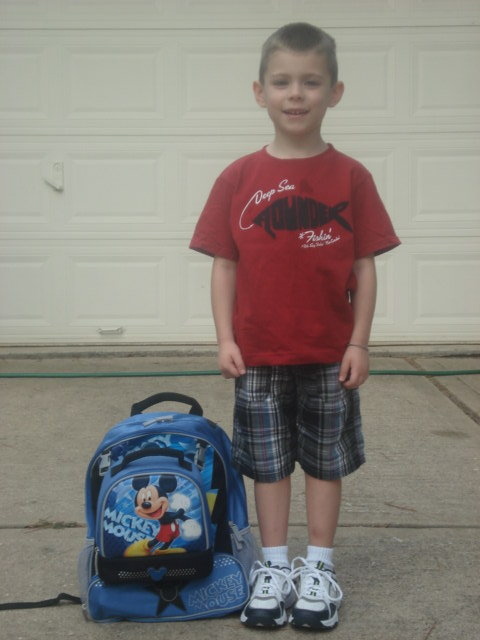 After a rocky start in Kindergarten, he thrived in first grade and had a wonderful and uneventful year. 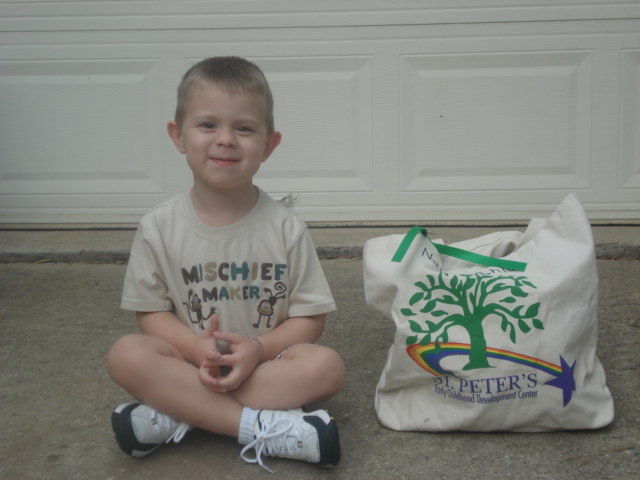 Now, our second child, Nathan, will be starting Kindergarten in the fall. We have already held his meetings with the school to have everything in place for the first day of school. We have him under the same restrictions and modifications as we had for Nicholas, and we are hoping that he will do as well as Nicholas did on the improved plan. Make sure the school is fully aware of the extent of your child's diagnosis and limitations, and make sure you do everything in your power to put the proper precautions into place. Get your child's doctor involved and ask him or her what the school should do for your child while he is there. Have the doctor write a letter or call the school to give pertinent information so the school has everything it needs to get the right plan in place. Be vigilant that the school is holding up its end of things and be observant of your child. Watch for those subtle signs of decline so you can intervene as quickly as possible before things get too out of hand. Don't hesitate to schedule a meeting with someone if you are afraid things are not working out as they should be. Revisit some of the precautions and modifications you have in place and stand firm in any changes you feel are necessary for your child's safety while he is away from you. Be as involved as you can with your child's class so you can help him to participate safely in activities that may be too much for him otherwise. Know what all your options are and your rights when it comes to IEPs, 504 meetings, and school placements so you can help the school make the best decisions for your child. Above all else, remember that you know your child better than anyone. You know what is best for him and you know the needs he is going to have. Go with your gut when making school decisions for your child, and don't let anyone sway you away from what you think is necessary for your child's success at school. You are your child's best advocate and as long as you go with your instincts and what you know is best for your child, school will be an exciting new chapter in his life! Melody Pohla is a stay-at-home mom to three boys with Mitochondrial disease, Complex I deficiency, and also has the disease herself. She and her husband are board members of the Houston Chapter of the UMDF (United Mitochondrial Disease Foundation) and are active members of the Houston area Mito Support Group. When she has a minute to herself, she is an active member of her local mother's group and the rest of her time is spent shuttling the kids to school, doctor's appointments, therapies, and the two older boys to Tae Kwon Do several days a week. You can keep up with her family at www.caringbridge.org/visit/pohlaboys.